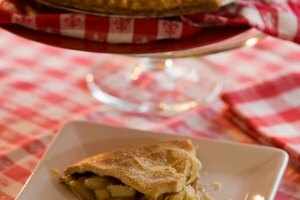 The first English apple pie recipe, which appeared in a cookbook compiled by the master cooks of of King Richard II, dates to 1381. Today it remains one of the Western world's most beloved pies. Pre-making and freezing homemade apple pie when you have a free afternoon is a good way to save time when you need it. Preparing an apple pie for the freezer is easy. You may choose to freeze the pie unbaked or baked. 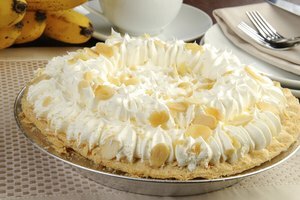 Unbaked frozen pies retain their flavor better, but the crust of the baked pie does not get as soggy. Prepare your favorite apple pie crusts and ingredients as usual, but add 1 tbsp. tapioca or ½ tsp. cornstarch to the apple-pie filling mix. This will absorb some of the filling juices and help prevent them from boiling over when you bake the pie. Shape your bottom crust in the aluminum pie pan, and add the filling. Lay the top crust on the pie. Do not cut any vents in the crust. Slip the pie into an airtight container or large freezer bag. Store in the freezer. 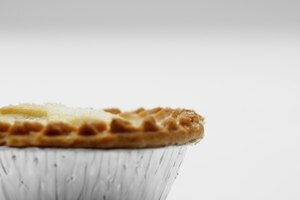 Be sure that the pie is upright so that no filling spills out before the pie solidifies. Prepare your favorite crust and ingredients, but add 1 tbsp. tapioca or ½ tsp. cornstarch to the filling. This will absorb some of the juices and keep them from boiling over when you warm the pie before serving. Shape your bottom crust in the aluminum pie pan, and add the filling. Lay the top crust on the pie. Slit the crust for steam to escape during baking. Bake in the oven for 30 to 35 minutes. Allow the pie to cool thoroughly. Take the pie out of the freezer. Remove the wrapping. Set the pie on the cookie sheet. Put pie in oven and bake for 15 to 20 minutes. Reduce the oven temperature to 375 degrees F, and continue baking for 20 to 30 minutes, until the crust is brown and the filling is bubbling. Remove from oven. 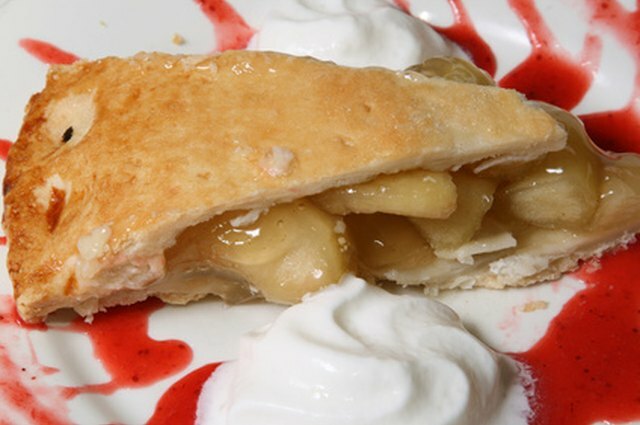 Remove frozen pie from freezer, and remove the wrapping. Allow to thaw at room temperature for 15 to 20 minutes. Place pie in oven for about 30 to 40 minutes, until the pie is warm. Remove from oven. Bake the pie within three to four months of freezing for best flavor. 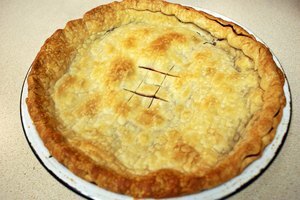 Iowa State University Extension: What Is the Best Way to Freeze a Fruit Pie?